Home News Addie's Birthday Party – February 27th! This year the birthday of Adelaide Hunter Hoodless will be celebrated on Monday, February 27th, 2012! Please join the good people of the Hoodless Homestead for an afternoon of historic house tours, fellowship, tea and birthday cake! The Adelaide Hunter Hoodless Homestead, is a National Historic Site recognizing the birthplace and childhood home of one of Canada’s most eminent citizens! Adelaide was born on February 27, 1857 and died on the eve of her birthday in 1910. 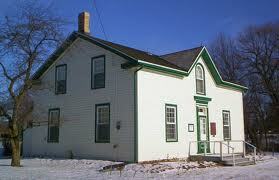 The Homestead is owned and operated by the Federated Women’s Institutes of Canada. The Homestead is located in Brant County, Ontario on the outskirts of the village of St. George: if you are coming from the East, take Highway 5 /Beverly Street and continue through St. George and across Highway 24 – the name of the road become Blue Lake Road on the other side of Hwy. 24 – the Homestead is a short distance along on the right hand side. BHS Speaker series: Zig Misiak – Western Hooves of Thunder!